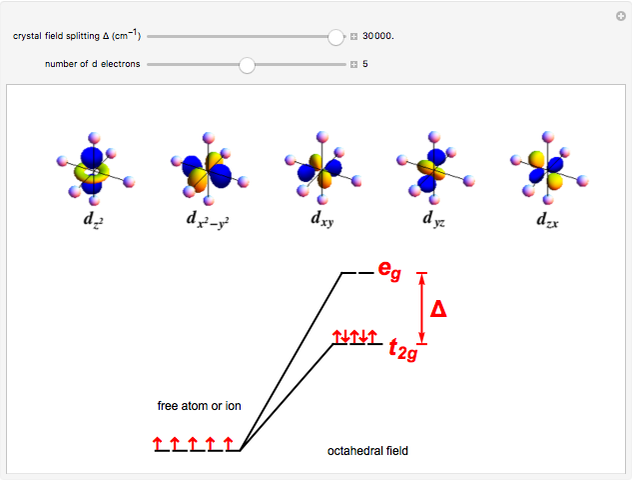 A free transition-metal atom or ion has five-fold degenerate -orbitals, pictured at the top of the graphic. These can be occupied by a maximum of 10 electrons. The positive and negative regions of the wavefunctions are shown in the blue and yellow spheres, respectively. Transition metals are likely to form compounds in which they are centrally bonded to several molecules or ions, known as ligands. These are shown as white spheres. A common configuration is the highly symmetrical octahedral complex, in which six equivalent ligands are bound to the central ion. The effect of the ligands can be represented by a crystal field parameter , whose magnitude is typically in the range 7,000–30,000 . The octahedral crystal field partially breaks the five-fold symmetry of the -orbitals. The and orbitals, which have lobes directed at ligands, become a higher-energy doublet which transforms as the representation of the octahedral group. The remaining -orbitals transform as a triply degenerate representation. 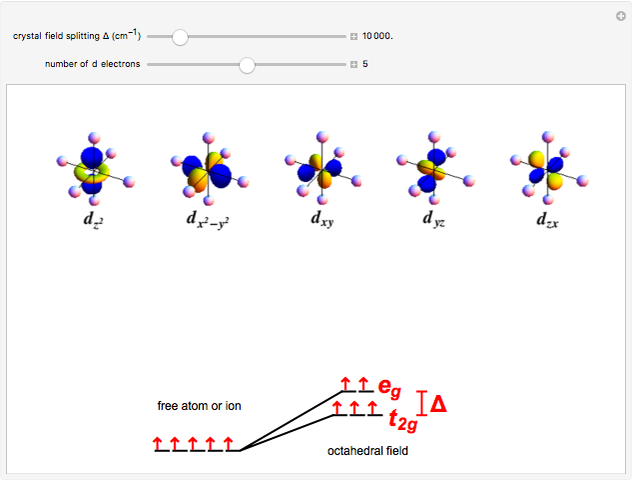 When electrons are successively added to the free atom or ion, they follow Hund's rule in occupying different degenerate orbitals, until—with six or more electrons—they are compelled to begin doubling up. In relatively weak crystal fields, roughly for , the orbitals fill as if they were effectively degenerate. In strong crystal fields, however, the first six electrons fill the lower orbitals before any enter the . High-spin and low-spin alternatives exist for configurations to , as determined by the magnitude of . These are reflected in the magnetic properties of the corresponding complex ions. Reference: S. M. Blinder, Introduction to Quantum Mechanics, Amsterdam: Academic Press, 2004 pp. 149–153. 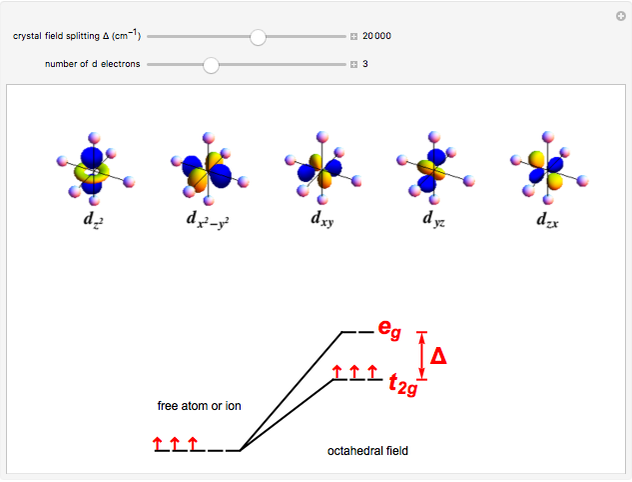 S. M. Blinder "d-Orbitals in an Octahedral Field"